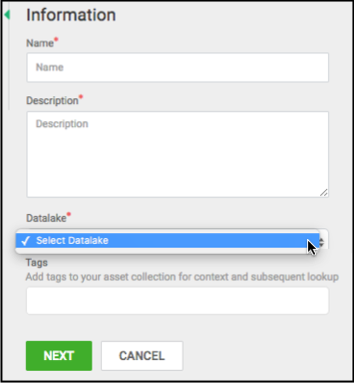 When creating an Asset Collection, no datalake displays in the drop-down menu. A datalake is a cluster that has Apache Atlas and Apache Ranger installed. If registered clusters do not have Apache Atlas installed or there are no clusters registered to Hortonworks DataPlane Service, then no datalakes are available.